#1. Look for people who respect wisdom in others. Can’t connect. An over-confident phony keeps everyone, except other phonies, at arm’s length. Belittle the experience of others. Hold others back. Know-it-alls can’t bring out the best in others because others aren’t that talented. Who has taught you the most? What did they teach you? What do you admire most about past colleagues? People who want to get ahead reach higher than those who don’t. Eager to earn promotions. The operative word is ‘earn’. It might be irritating to deal with someone eager to earn a promotion. Do you really want a team full of people who don’t care about promotions? Interested in titles. People with ambition enjoy feeling respected. This might include an interest in earning a title, educational status, or certifications. I have coaching clients who are both humble and interested in earning the title of CEO. Desirous to sit at the table with leaders who have power and authority. 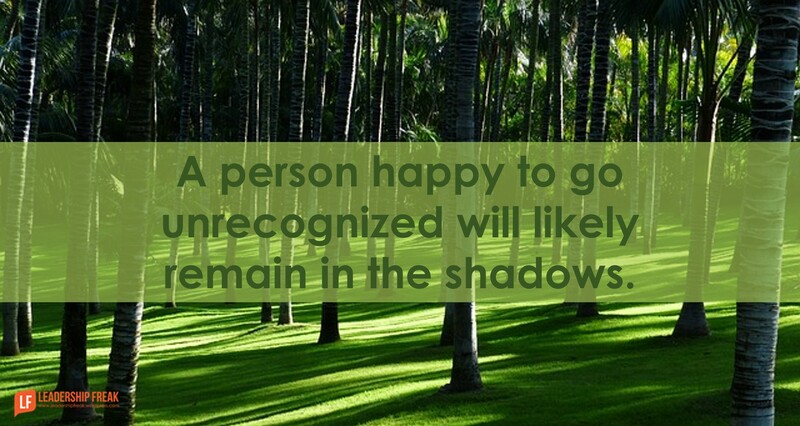 A person happy to go unrecognized will likely remain in the shadows. Note: The future leaders that Jesus chose argued about who was the greatest and who would get to sit in positions of honor. Striving for popularity at the expense of character. Soliciting favor through dishonest means. Switching positions on important issues quickly to stay on someone’s good side. Seeking prestige at the intentional detriment of others. Note: Passion and ambition are different. Passion is enthusiasm to do well, regardless of recognition or pay. That doesn’t eliminate the value of healthy ambition. How might leaders spot future high performers? Wisdom. Great word. Perspective is excellent. Ambition, especially when connected into a team effort, is excellent. Recognize also that the right new performer can raise the tide for all the boats, being able to share enthusiasm and energy and new ideas. Be careful that the Spectator Sheep do not drag them down to the norm. Thanks Dr. Scott. The inclusion of ‘team’ with ambition really helps me. Unhealthy ambition sacrifices team efforts for individual success. Your warning is well taken. New leaders want to fit in. They pay attention to the behaviors that are tolerated. The things we tolerate we teach. Precisely. MORE good insights, Dan. You do a great job with your posts and I think your readers try to do a good job with their comments. Wonderful blog deserving of the recognition it gets. Thank you. There is so much to learn from observing these “people” and this post puts it in perspective. 2. Titles when our small private firm was acquired by a large public one I was given a meaningless title by HR. I ignored it, worked hard and in two years became the overall CFO. So sometimes you have to ignore titles. 3. Seating at Business Meals- can both make or break a career. Those who are overly ambitious and outspoken often cut their own throat so to speak. Thanks Brad. I appreciate you pointing out the down side of unhealthy ambition. As with most qualities, there is a dark and bright side. I’m hoping to open a leaders eyes to the idea that ambition might indicate a person is a future high performer. I have seen those who are ambitious mistake knowledge for wisdom. For me, wisdom=experiences in which the application of knowledge revealed truth. So by that definition wisdom is not quick, it is accumulated over time. It is a great combination when you find those who are eager to excel and are patiently willing to learn as they go. Thanks Will. I’m glad you expanded on the idea of wisdom. Confusing knowledge with wisdom can be harmful. “Learn as they go” really speaks to me. Wow! honestly, I have nothing to say! I just want you to know that I cellebrate having suspscribed to this blog! This teaches a young boy like me to never quit doing what he loves!